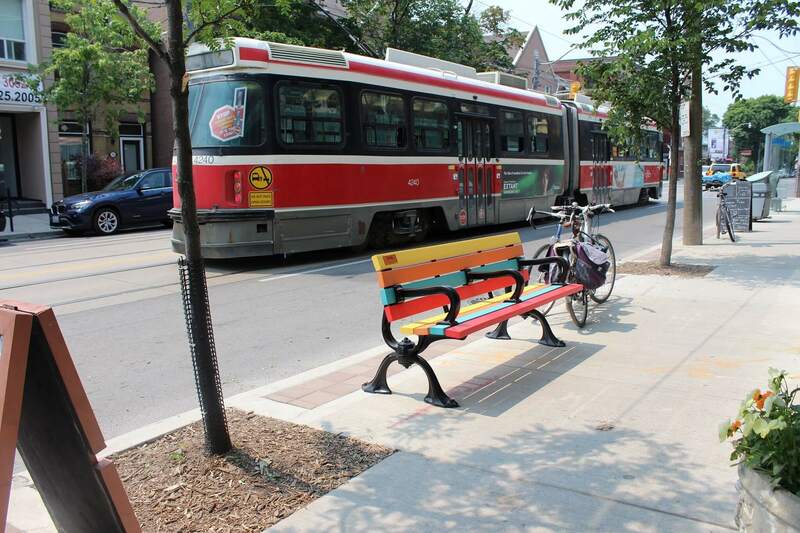 The coloured bench in the logo was then brought to life and placed everywhere along Queen St. E. in Leslieville. And, many of our local area developers (The Daniels Corporation of ‘The Logan’ rendering below), are embracing this icon as a welcoming emblem of one of the coolest neighbourhoods in the city! And so, where does this take us? Well, it takes us to Ms. Kinnon Elliott of Kinnon Elliott Design. Kinnon has been with us along our branding journey, helping us evolve and stay fresh. Did you know that all Leslieville BIA signage and event promotional material are Kinnon's work? Well, yeah! Kinnon, it's way past time to take a bow! We've included an interview with this hard-working design genius below so you all can get to know the woman behind the 'hood's look! 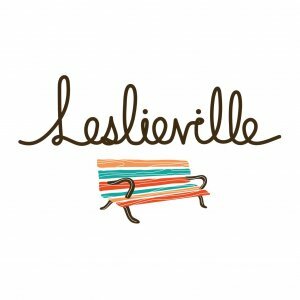 Did you choose Leslieville or did it choose you? I've been an "East-sider" ever since moving to Toronto in 1999 so I've known of the neighbourhood for a while, but in 2013 I became a real card-carrying Leslievillian with a move onto Queen St East. I've always liked that it feels very human-scale, a smaller town within a bigger city. I love that nearly everything I need is within walking distance—not just stores and groceries but parks, the waterfront, and nature trails. During the week I might meet a client at one of the coffee shops along Queen; on the weekend you might find me walking the Leslie Spit, swinging by the Farmers' (or Flea) market or meeting a friend at a brewery. There are some weeks when I don't even cross the Don Valley! 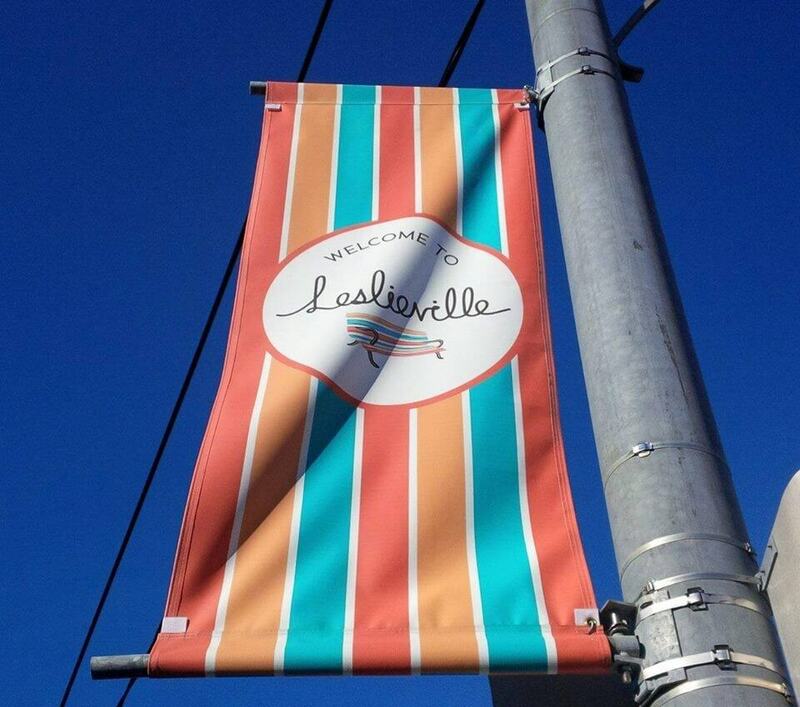 What inspires your work for the Leslieville BIA? 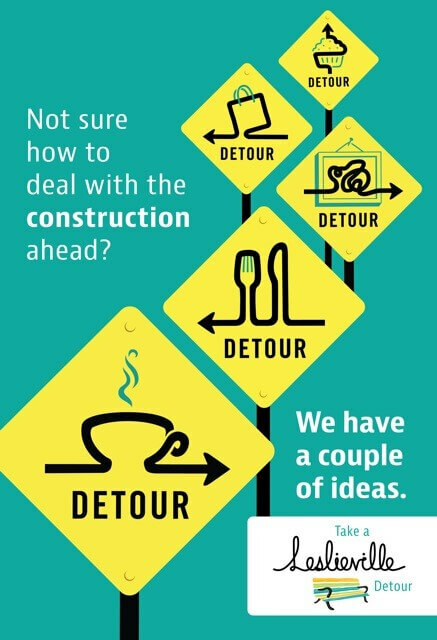 Ever since the first project I did with the BIA (the Take a Leslieville Detour campaign) and read in the design brief that the BIA was looking for something that reflected the cheeky and independent spirit of the neighbourhood, I knew (or at least hoped) we'd get along just fine. It takes so much resilience and individuality to be a small business owner in this climate, and so I try to reflect that in the design with bright, bold colours, quirky illustrations, and a healthy dose of humour (and pride!) 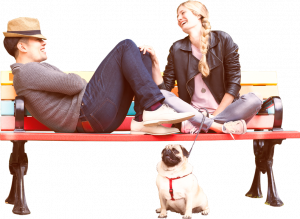 When so many of my clients are based across town or even sometimes on the other side of the world, it's been very rewarding to work with the BIA on projects that are literally close to home, and that are made with my actual neighbours in mind. Is there a person past or present who you really admire? Why? Two illustrators I really admire are Jillian Tamaki and Lisa Hanawalt - two talented–and very different–women with strong personal artistic styles. Hanawalt has published a couple of very funny and weird books and also did all of the character designs for the Netflix animated show Bojack Horseman. Tamaki also has so many wonderful books, but I absolutely fell in love with her graphic novel This One Summer (co-written with her cousin Mariko Tamaki), and then went back and tried to read everything else she’d published. I think what I admire most about them is that they've made room for their voices in the world by putting their art out there in all its beauty and weirdness, have told incredible and poignant stories, and found success by being themselves. When I was really young I had a couple of the usual little-kid ideas (ahem, ballerina) but in high school I joined the drama club and started working backstage on school plays and musicals. I was totally hooked; I moved here to attend Ryerson and, after graduating, worked as a Stage Manager in Toronto for nearly 10 years, touring also to Victoria, Edmonton, Winnipeg, and St. John’s. It was a great career, and I was lucky to work with some truly creative and talented people, but I kept wondering if that was really "it" for me. For my entire life I had always drawn, but it had never occurred to me that it was something I could make a career out of. So, almost on a whim, on a hiatus between shows in 2010, I took life drawing, illustration, and software classes at George Brown, and liked them so much I eventually made the full switch to graphic designer & illustrator by 2012. I still don't really know if I'll ever feel "grown up" but I'm thankful every day to be my own boss, in a creative job, working alongside people who are trying to make their communities better and brighter places to live. Hmm, all I can really say right now is: working as freelance designer with a delightful roster of clients! Okay, one specific client I can talk about right now is Crow's Theatre. Their new season of incredible plays begins this week (Oct 9) and runs all the way until spring 2019. Not only do they have great shows, but I love that they're becoming a real hub for the community: they've got Sunday concerts for families, kids' drama classes, and other events. Check them out if you can.